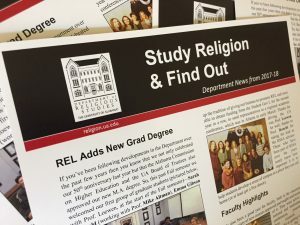 A nnually, we mail out a newsletter to current students, grads, and friends of the Department, though there’s also other times when we try to contact our graduates — such as when we were planning our MA degree, in 2016-17, and queried them for their input to the proposal. So we’re eager to stay in touch with you after you leave Tuscaloosa, whether to hear of your accomplishments or ask you to write a post on our grad blog and maybe even invite you to come back to town to talk to our current students about what might await them once they graduate. So we hope you’ll stay in touch. Click here to update your contact information and to send us some news. Learn about our Alum Liaison Committee. Learn about our Alum Recognition Award. Or consider making a gift to REL.